Even a brick chimney, when first built would have been lined. In the old days this would have been done using a lime based pargeting or render. However, acid and sulphate attack over many years decays the lining so it is crumbled or swept away to expose the bricks. 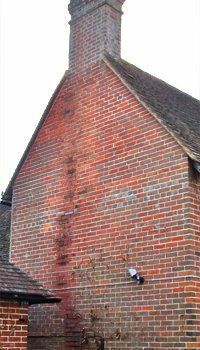 The mortar of the brick work also decays until fumes and smoke is able to leak out of the chimney to other flues and possibly into rooms. More recently chimneys have been built with pumice, concrete or clay liners. The type of chimney lining and materials vary, depending on the type of fuel, appliance and house construction. For example, boiler stoves need a lining resistant to tar, creosote and acids, new properties cannot be lined with flexible liners and thatched properties may need a twin wall insulated flue depending on Building Regulation requirements. Chimneys are lined for a number of reasons, safety being the primary one. All stove installations are subject to Building Control. Older damaged, decayed or eroded flues can leak smoke and fumes into other flues, rooms or other parts of the building which can lead to carbon monoxide poising. This can also cause frictional resistance to the flow of the gases resulting in poor up draught. Patches and staining on internal or external chimney walls caused by tar etc seeping through porous brick work (left). Lining with insulation included improves the operation of appliance and flue (particularity important when the chimney is on an external wall). Large flues particularly ones containing voids may affect appliance performance and can be dangerous due to spillage of fumes back into the room. Combustible materials maybe in or close to the chimney, particularly in older listed buildings and thatch properties. Lining with a twin wall insulated flue reduces heat transfer and results in safer insulation. Some clay liners are not soot fire resistant and have been downgraded to oil or gas use only, or may have been installed upside down. Flexible stainless steel liners - for gas, oil, solid fuel and wood. Rigid single skin connection pipes and new build twin wall insulated flue systems for all fuels. Isokoat Class 1 Lining System - wet applied by drag system to seal leaking open fire chimneys and keep flue to its largest possible size. Particularly important with Gas Flue Block Systems and to keep fireplaces from smoking back. 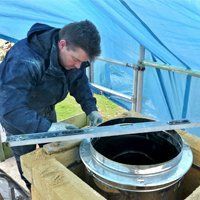 Isokern Lining System - Sectional pumice cement liners for all new build chimneys, central heating stoves and slumbering solid fuel appliances such as Rayburns.